Established in 2014, The Unconscious Collective makes large-scale installation and experience-based artworks based around an informal investigation of communication that occurs outside of language or intention. The collective has, for example, created complex environments in motels and hotels for the purpose of affecting the dreams of guests by using subtle sound and light-based works designed to enhance and expand whatever experience people might have when not awake. This is an area of investigation that might be more traditionally seen as scientific, asking questions about the nature of dreaming and whether it is a permeable state. The Unconscious Collective do use scientific information and concepts, but they also disavow clinical approaches, allowing experiences to occur rather than seeking to control them. There’s an interest in the subliminal and the haunted, and much of the group’s continuing practice has developed ways of experiencing and investigating these states. The collective’s most recent work sidesteps the world of sleep for the awakened state, but still focuses on the natural rhythms of bodies not under conscious control. The subject under investigation is a somewhat peculiar phenomenon, known as entrainment—a complex and fluid concept that might refer to a crowd of people all tapping feet together at a rock concert, or to an activity more deeply biological. Colloquy of Hearts is concerned with a very particular articulation of this concept: if two people are able to hear one another’s hearts beating, and if they calmly listen to these beats for a length of time, their heartbeats will begin to move towards synchronisation. It’s a real and quantifiable occurrence at once eerie and rather sweet: two hearts beating as one, and not in some metaphorical sense. It really happens, if the circumstances are right and the participants are people who are able and willing to relax and listen. That’s the idea and, rather ambitiously, it’s what the Unconscious Collective aimed to achieve in their latest work: a tranquil space where people can hear one another’s hearts beating. One of the work’s makers, David Patman, says that up to 4 heartbeats can fall into sync through the entrainment process. The journey towards realising this possibility was challenging, taking 18 months to realise. How was it done? The answer arrived in the form of a lounge suite. 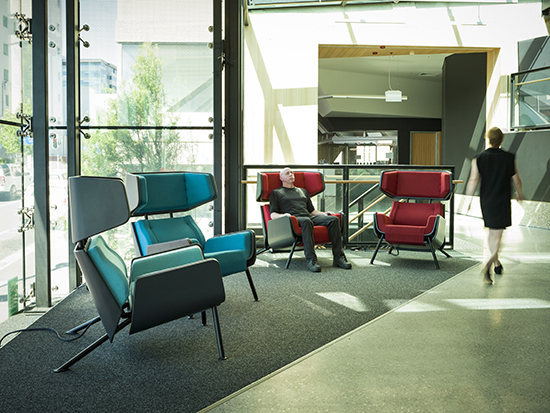 Located at the University of Tasmania’s Menzies Institute for Medical Research, The Cardiophonic Lounge consists of four beautifully designed and extremely comfortable chairs and some equally pleasant footrests. Created by Michelle Boyde and Guy Paramore, the chairs are elegant beasts, each upholstered with a slight variation on the colour of either venal or arterial blood. Once you’re seated, a gently rushing score composed by Matt Warren seeps from the chair’s wings next to your ears, and after another short pause, a gentle throbbing announces the arrival of your pulse. It’s a remarkable technological achievement. 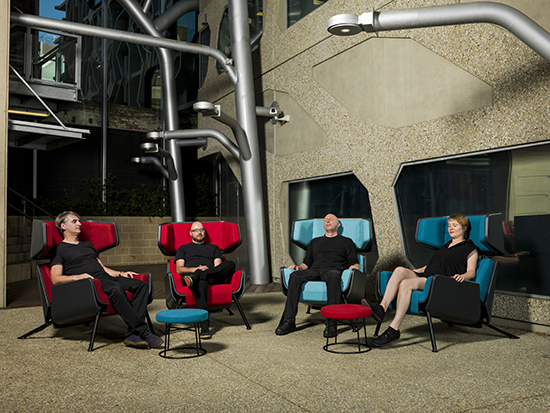 You simply sit in the chair and there’s no need to strap in or wear some disconcerting headband, the furniture does it all by using a non-invasive ballistographic sensor which records the vibrations blood makes as it moves around the body. There’s one inside the chair and it becomes active as soon as anyone eases into the seat. The real trick was to write an algorithm that converts the electrical signal into sound, and for that sound to mesh with the soundtrack as part of an overall pleasant experience. This rather intricate feat of coding was accomplished by Richie Cyngler, an electronic sound maker in his own right, but wearing more of a programmer’s hat here. The big thing is that it doesn’t just work, but it works seamlessly. Every detail has been polished and checked; the chairs are very satisfying aesthetic objects, gorgeously constructed; the sound is elegant and transporting; and the moment when one’s heartbeat arrives is gently thrilling. The execution is masterful, but where this work really shines as successful art is that it is really about a magical human interaction. After I sat for a while, I and my companion—my mum, as it happened—experienced that moment of wonder as the audible beating of our hearts softly aligned. See images and sounds from other Unconscious Collective creations including a digital confessional, a two-night road art trip to Cradle Mountain National Park, sound sculptures using the dreams of primary school children and an installation of suspended, custom knitted snooze pods, presented at Melbourne’s MPavillion this year. There’s more on the group’s website.